I`ve had a lot of positive feedback from website owners who are happy to know the truth when it comes to SEO myths. 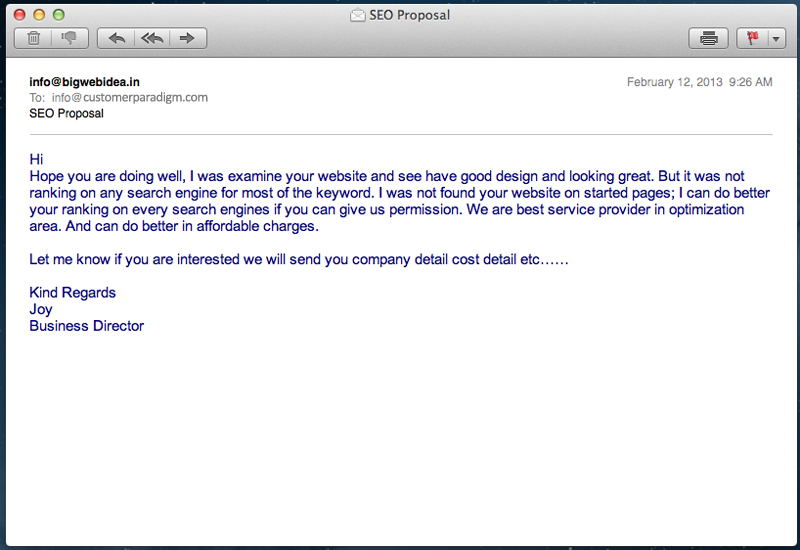 This week, I`ll tackle a constant trend: Unsolicited SEO offers via your website`s contact form. The irony is that they found your site because you do actually rank in the search engines. Perhaps not as well as you might like. There`s always room to improve. In cycling for example, you can always go faster (that`s why doping has been such an issue in the sport today). In search rankings, there is always another keyword you could rank higher for. But the fact is, they probably found you via a search on Google. Why fill out a contact form? Because at most companies, contact form submissions are usually read – often by the owners or managers of a Website. Just like last week`s topic, SEO Myths Debunked #4: We took a look at your site, and there are some things in the HTML code that are not optimized for search engines… the unsolicited SEO offer via your contact form is trying to trade on fear, uncertainty and doubt. Even our company`s website, Customer Paradigm, gets form submissions like these from time to time. I know our domain authority, and how many inbound links we have to our site (10,684 at last count). But just for fun, I`ve played along and responded back on the phone. Partly out of morbid curiosity, like when you see a car crash on the side of the road… you just have to look. And partly out of research to find out how they are trying to instill fear and doubt into many of our clients. If someone contacts you through your website telling you that you don`t rank well – chances are that they found you through a Google, Bing or Yahoo search. 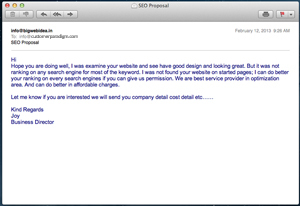 Ironically, they are contacting you because you rank in the search engines. I hope you enjoyed this SEO Myth Debunked… Stay tuned for more next week.